Simon, who still controls the business. The business was started as a market stall, with the first shop opening in London’s Beuchamp Place. The business now has about 1400 locations in 74 different countries. Monsoon is known for it’s theatrical window-dressing and edgier, more premium product than high street competitors. Where can I check my Monsoon Gift Card Balance? 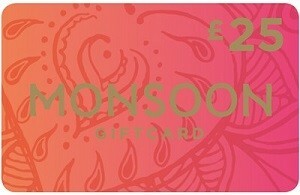 You can check your Monsoon Gift Card balance on their website by clicking here. You can check your Monsoon Gift Card balance at any Monsoon or Accessorize store. If you would like to find your nearest store, check out the store-finder page.